As we transition out of being a young person into being a young adult, a lot of things about us get tested along the way — our character, the things we enjoy, our relationships. We are changing and growing. The way we see the world is changing, and sometimes it’s happening without us even realizing until one day we discover we aren’t the same person from last year. One aspect of transition that has surprised me is how my faith is changing. Surprised is maybe to nice a word — stirred up might be a better phrase for the feeling. Over the course of college, I’ve looked at my faith and seen that it isn’t the same as it was when I was a kid, or even in high school. Sure, it’s not supposed to be. We’re supposed to keep growing. Part of me has wondered at times, though, will my faith stand the test of time? And even scarier, will my faith push me to act more and more in ways that define a great life? If you’ve ever wrestled with these questions, let me tell you about a book I read this summer that helped give me perspective. 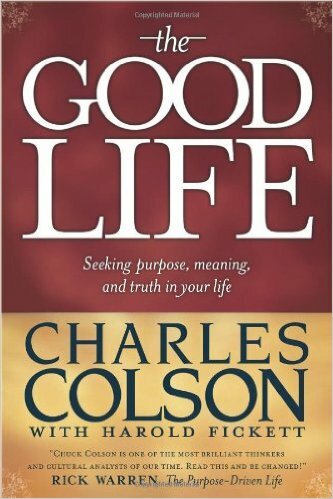 The Good Life by Charles Colson is a collection of stories showing the contrast of what makes up a great life versus a life that lacks true depth and meaning. Colson discusses these stories head on, pointing out characteristics from each story (such as community and self-sacrificial love) that define a truly good life. He includes stories as well that show, by contrast, the sadness of what our lives can look like when we leave truth by the wayside. Colson was a politician during Nixon’s presidency. He had climbed his way to the top into Nixon’s inner circle by the time of Watergate, and for his involvement in that scandal, he was imprisoned. Being stripped of his power and honor, Colson hit rock bottom, and in prison became a Christian (his book Born Again is the account of his journey). The Good Life is written by a man who experienced both sides of life. Colson knew all to well how the competition for political power drained his life of meaning when he was part of the White House. Yet he also discovered paradoxically how being brought low gave him the chance to find meaning and restore him at his deepest. This book encouraged me by showing me that is many ways I am seeking the truly good things out of life. However, this book is not a feel-good book in the least. It challenged me even as it encouraged to keep striving and to never give up fighting for the best in life, even when it’s hard. Going by the stories in The Good Life, it often is hard. But it’s worth it. Give it a read! It will shape your thinking and inspire you in the best possible ways. I went to the Indiana Faith and Writing Conference in Anderson, Indiana this weekend. From it, I learned enough to keep me journaling for an entire day! My goal was to share advice I learned from it about stepping into professional scenarios in which we’re the minority as young people. However, what I learned isn’t a tidy list of tips, but deeper truth about our passions. Do you remember the birth of your passions? I do. Every day growing up, I felt them steadily vibrating like violin strings in my soul. When I thought about what I loved – writing and ministry – I felt physical hunger. I dreamed about using my gifts, and imagined people being changed for the better by them. These passions drove me to seek the highest from life, to give others the love we all crave with my gifts. This drive came from the internal assumption that my gifts and desires had power – that I had abilities to reach into people’s lives in ways no one else could. Along the way I’d lost sight of that. I doubted the worth of my passions and dreams. At my college, I’m surrounded by people who share that same drive to have impact. I began to lose sight of how my particular passions and dreams were unique. What if there were people who could do the things I hoped to accomplish better than I? Until the conference, I hadn’t even realized I’d begun to think this way. All I could sense was this dullness in my spirit, a sort of monotony and mundaneness. My internal zest was diminished. The conference jumpstarted my passions because it reminded me of God’s thumbprint expressed uniquely in me. God’s thumbprint…it’s on every person who has ever lived – His image in all of us. Yet, universally, that thumbprint varies with everyone. How does this contradiction work? Because He is infinite. We are all expressions of who He is, and these expressions extend from his infinity, going on forever. There are infinite versions of how God expresses Himself in us, so none of us can be the same. At the Indiana Faith and Writing Conference, I was surrounded for two days by people who had the exact same heart passion as me: writing. Yet, in that also, I saw how each of us was vastly different. My own skill and gifts stood out because I was surrounded by people who were so similar to me. I saw how God chose to put his thumbprint on my being with something that only I could fulfill with the passions He’s put in my heart. I felt urgency to live with the calling to live out God’s independent expression of His image in me. As we grow into adults, we often fear that our dreams and desires for doing good, wonderful things fall short. Our passions are precious, but do they really have potential? If God has given us a unique expression of Himself, how could our passions not have potential?